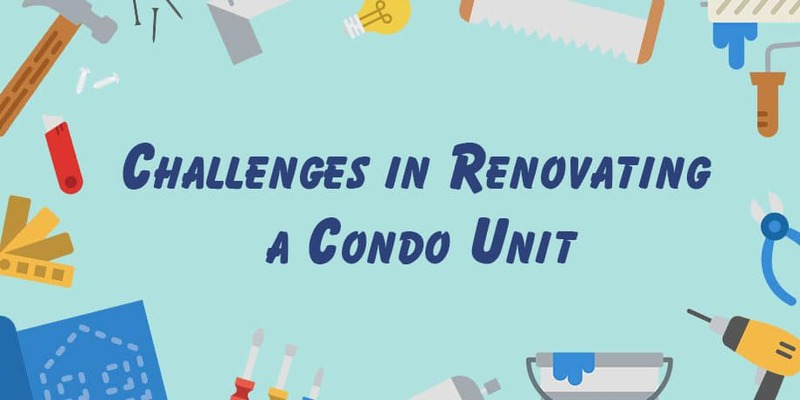 WHAT ARE THE CHALLENGES IN RENOVATING A CONDO UNIT? Renovating a condo is unlike renovating most other properties. Renovating a new condo is also different from revamping an old condo. If you are considering condo renovation, you should be aware of the rules governing renovations in the building.It is highly likely that you may not be allowed to do what you planned. Make sure to check the declaration to find out what part of the building is owned jointly by the owners and what is owned by initial owner. The usual rule is that you can make changes to the property that you own. The common elements can be changed only with the permission of the association. Usually, unit front doors, windows and balconies are considered as common elements. Many condo associations can even disallow any renovations that involve the electrical or plumbing elements. In some cases, there may even be restrictions on structural renovations. If any resident carries out any renovations which are not allowed, the association may ask them to put things the way they were. How Renovation Should Be Carried? How the debris can be disposed? In fact, based on the type of rules it is also likely that many contractors may not want to work on a condo renovation project. This is why it is important to have your condo association involved in the process. The building’s structure can also limit what you can do in the renovation. So if the ceiling is made of cement slab, you cannot add certain types of lights. Similarly concrete slab as walls can mean that new plugs cannot be added. There may also be limitations to debris removal. The association may limit a dumpster to remain on the property for a day or two. This can mean that the debris will have to be stored in the unit. Besides, the rules may also prohibit dirtying the elevators and other common areas. If the rules don’t allow you to make changes to the plumbing behind the walls, you cannot move the toilets and sinks. The only alternative may be to extend the pipes which can increase the costs. You may have to check with the rules even for making any such changes. If you want to renovate your condo, it is best to start the process by discussing your plan with your condo association. You should create a covering letter with the plan details for approval. Amidst other concerns, timing is one of the most concerning limitations. Getting materials and removing debris from the unit is limited by this factor. Most associations have fixed time when trades persons can work or be present on the property. Parking is another subject of concern. If the condominium association has a condo management company, they can make the process much easier.